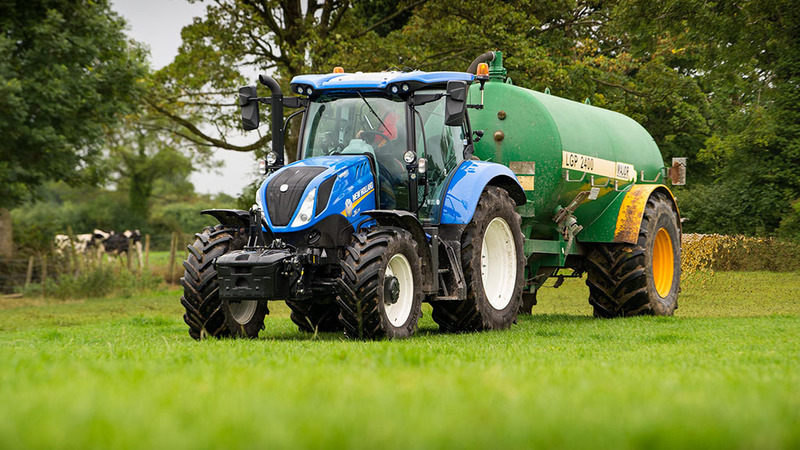 When it comes to powershift choice in its T6 tractor range, up until now New Holland’s offering has been limited to its tried and tested 16 by 16 semi-powershift transmission. In fact, the lineage of the current ElectroCommand transmission can trace its roots right back to the introduction of the SLE ‘box on Ford’s 40 Series tractors. Since then, the firm has built more than 300,000 of these transmissions, featuring in its TS, TSA, T6000 and now T6 tractors. Safe to say then it has been a popular transmission which people are familiar with, and is why it will not be being dropped from the manufacturer’s range just yet. But time moves on, demands increase, and New Holland felt the time was right to introduce a completely new powershift transmission – slicker, snappier, more efficient and with greater functionality. This is where its new 24 by 24-speed Dynamic Command transmission (DCT) fits in, slotting between the ageing ElectroCommand and its AutoCommand continuously variable transmission (CVT), and available on the four largest four-cylinder T6 models. Essentially, DCT is a modern take on a semi-powershift transmission, comprising three ranges with eight gears in each range. Though this may sound similar to New Holland’s three-range, 18-speed RangeCommand transmission, as used in its old 60 Series, TMs and now T7s, it is substantially different in the way it works and what it offers. DCT’s technology is based on the same principals as used in the firm’s CVT, which enables fast mechanical range changes. In this instance, those principals are applied to the powershift changes. This sees the tractors’ eight powershift gears split between two shafts; odd gears mounted on one, even gears on another. 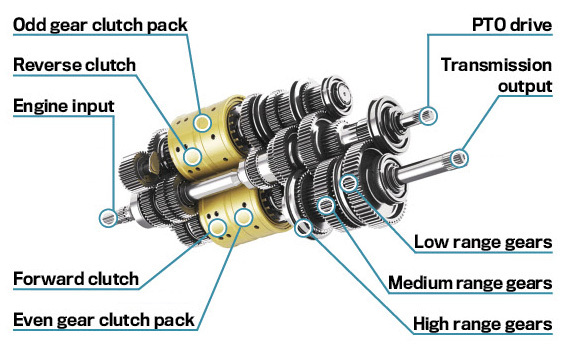 Via a clutch pack on each shaft, power can be routed quickly from one shaft to another. And it is quick too, even the range changes do not hang about which are taken care of via a third shaft. Separate clutches also look after shuttling, reducing any delay. Cleverly, the gearbox will also predict whether you are changing up or down and will pre-select the next gear. Making the most of ‘usable’ gears, there is a considerable overlap between low and medium ranges. This means you will have a tendency to stay in one range for a job, rather than having to flick between ranges to get the ideal gear. High range is then pretty much reserved for transport duties. Like many transmissions, DCT can be operated in manual or automatic mode. When in the latter, shifting characteristics can be altered via a dial. Winding this down will achieve a more economical drive with short gear changes on the way up and a large engine droop before downshifts are made. Conversely, winding it up will see an increase in tractor performance, with the engine allowed to rev out a lot more before upshifts are made. This effectively allows you to tailor the tractor to the job in hand, as does the ability to alter the start-off gear. However, for ultimate ease of use, we reckon having two pre-set transport modes would be good; one for unladen trailers which puts the start-off gear higher and adopts an economy driving mode, and one which puts the start-off gear lower and gives maximum performance. Though the logic of the start-off gear means that if you stop in a gear lower than your start-off gear, the tractor will maintain this gear while stopped. Whether operating in fully automatic or in semi-automatic, whereby shift changes are limited to within a range, the total number of gears used in automatic can also be limited to a selection of your choice. This prevents any unnecessary or unexpected shift changes from occurring. Skipping ranges is also possible. When this happens gears are speed matched to change to the next appropriate gear. And should you mash the throttle, a kick down function will see the ‘box drop a gear in reaction to the demand in performance. 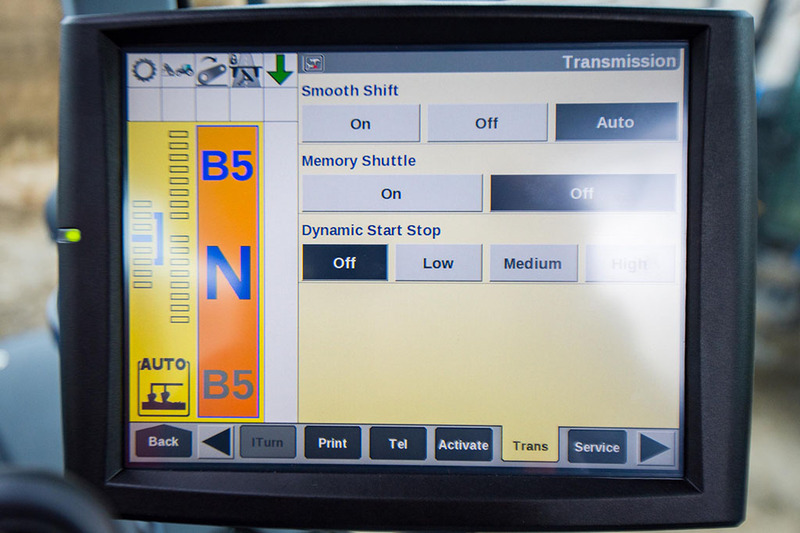 Delving deeper into transmission set-up, via the tractor’s touch screen terminal, reveals a whole host of other functions. ‘Smooth Shift’ turned out to be a particular favourite, which gives a grin-inducing blip of the throttle when a down shift is made, along with a dip in the throttle when upshifts are made. As the name suggests, this is designed to give smoother gearshift, while at the same time offer better protection of the transmission. It can be turned on or off, or used in auto which sees it turn off when the pto is engaged. ‘Dynamic Stop/Start’ is a useful function too, which, when engaged, will automatically pull the clutch in when the brakes are applied. But rather than just on or off, clutch disengagement is progressive, and can be set to one of three levels of aggression. 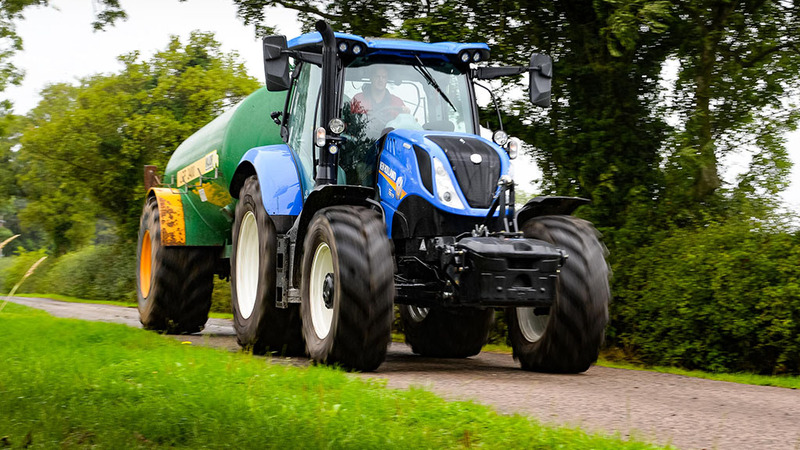 When combined with automatic transmission mode, allows the tractor to be driven virtually like an automatic car. It is also useful for loader work and when round baling, for example. Finally, a ‘Memory Shuttle’ function allows you to set a difference in gears between travelling forwards and backwards. For example, for loader work, you might want a slower gear going forwards and a faster gear in reverse. It will also remember different forward and reverse start-off gears, ideal for when tipping trailers. And still to come, which will utilise the scroll wheel on the main control lever, will be a target speed function. Much like a CVT, ‘Ground Speed Management’ will allow you to dial in a speed, leaving the engine and transmission to work out the most appropriate revs and ratios. Our model came with the firm’s top-spec SideWinder II armrest control concept, featuring movable main control lever and IntelliView IV touch screen terminal – a fixed lever version is an option. In addition, rather than the touchscreen terminal, a simpler ‘display of gears’ (DOG) screen can be specified, along with mechanical spools. In this instance, transmission functions are set-up through the dash. With the standard high-spec control option, gear changes can be made by either moving the lever or using buttons. In reverse, the lever also changes up when pulled backwards, logically working in the same direction as the tractor. By offering a varying spec of controls, it would seem New Holland has made an effort to make this new transmission available to as wide a customer base as possible. However, we think it could have gone one step further by offering its Classic-spec controls, lose some of the functionality, and just offer basic manual control over DCT. As for the top-spec variant, much of the transmission is setup through the touch screen terminal. 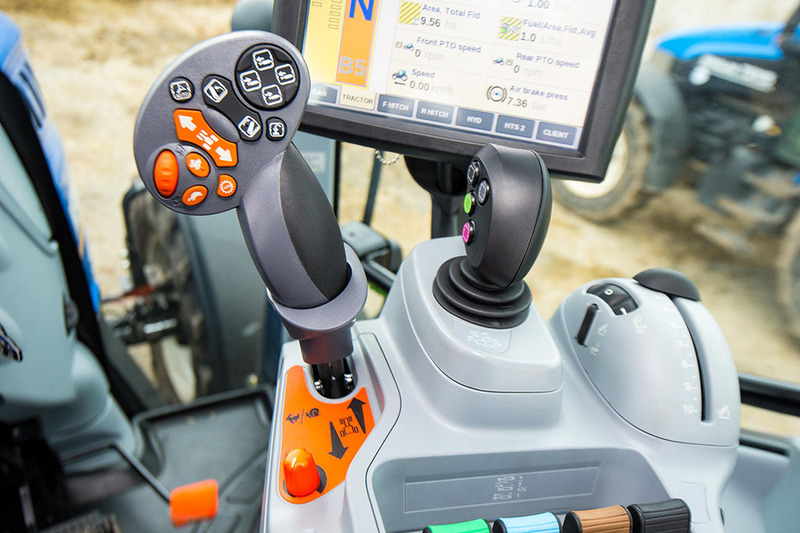 Thankfully, New Holland has created an onscreen shortcut button, leading to a dedicated page where all of its functions are neatly grouped together (further functionality panel). Though it sounds complex, from here most aspects of the ‘box can be set up and adjusted with relative ease. It is fair to say we are big fans of the new Dynamic Command transmission. 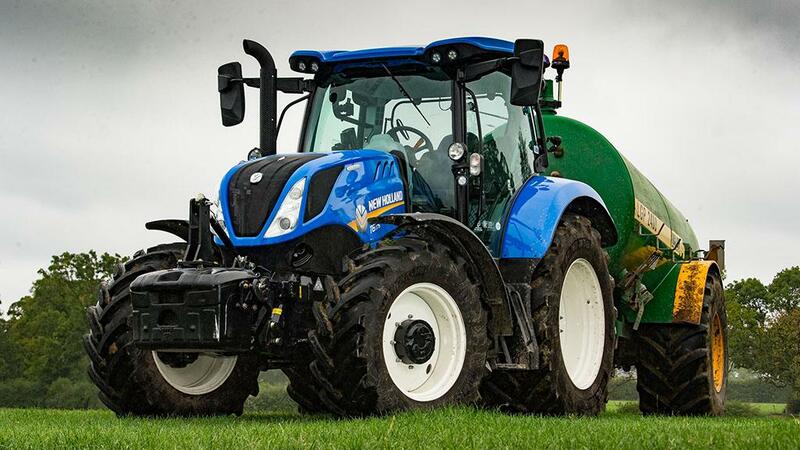 And if New Holland does not put it in its larger T7 range, then it needs to have a long word with itself. Smooth, quick and packed full of functionality, DCT is a pleasure to use. In many respects, it is more convenient to use than a full powershift, which often require a laborious plod through the gearbox. And though it will not beat a CVT for absolute convenience, it certainly is not far off.